Jusuf Nurkic is a beast. A Bosnian one at that, and someone who has won over the hearts of Rip City since his arrival in February 2017. The 7-footer has been mostly productive and always entertaining, and he found a way to enhance the latter despite falling to the Sacramento Kings on Monday night, 115-107. This all started in the first quarter after a screen by Nurkic which led to Shump walking up on Nurkic. When Nurkic tried put his hands on Shumpert (couldn't' tell if he was trying to calm Shump down), he moved Nurkic's hands out the way. Oh my. We are almost one year to the day removed from a bizarre locker-room confrontation involving Chris Paul and the Los Angeles Clippers. This is obviously unfortunate news for the NBA. The league, which has been through some bad boy eras before and isn’t looking to go back any time soon, wants the attention on the court and not its behind-the-scenes confrontations. I believe it is worth noting: Before Iman Shumpert began his postgame availability, a team official told him "we don't need a viral moment" to Shumpert. Shumpert was animated while talking off the record with a national reporter before cameras came on, though. The worst part about it? 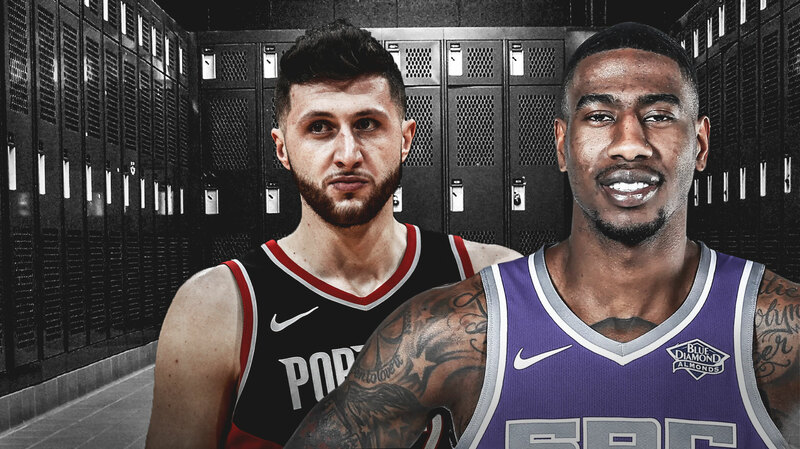 Nurk might not be wrong. Shumpert’s current 9.4 points per game is a career high, but when the inevitable happens and he’s off the Kings’ roster (so Sacramento can build a team with the collective career arc of De’Aaron Fox and Marvin Bagley), what comes next? Is he a veteran enough presence to be a positive influence on another young locker room? Is he talented enough to land a spot on a contender as the 11th man? Shumpert is 19 days older than Damian Lillard. Let that sink in. We’re not talking about Vince Carter or Dirk Nowitzki. Nurkic told a 28-year-old his days in the NBA are numbered. Bosnian Beast? The 24-year-old is a stone-cold savage. And Rip City is here for it. Shumpert keeps chirping after the game is over. Kevin Calabro goes full dad and is all of #RipCity right now, "You know, Iman Shumpert should just turn, go to the locker room, and enjoy the win."